I can't stop buying aubergines lately. It's so cheap in Lidl. Here is another nice and easy recipe. It's stuffed aubergine with minced pork. In Chinese this is called 'yuan bao qie zi' 元寶茄子, loosely translated as Chinese gold ingot aubergine. Make a pork mince mix with about 150 - 180g of minced pork (depending on the size of the aubergine), mix this with 2 - 3 large soaked and finely chopped shitake mushrooms, 1 tbsp of chopped ginger, 2 tsp of light soy, 1 tbsp shaoshing wine, pinch of ground pepper, 1 heap tbsp of cornflour and 1 tsp of sesame oil. Leave this to marinate for about 15 minutes. Then take one large aubergine, cut off the stalk and slice the aubergine into fan shape about 7 - 8 mm thick slices, taking care not to cut through leaving about 0.5cm underneath uncut. Using a butter/serving knife, gently stuff the pork mixture in between the cuts. When done, smooth the surface and gently squeeze both ends towards the centre to firm up the meat. Then either steam the aubergine or bake. Steaming is the traditional method since most Chinese kitchens do not have an oven, this will take about 20 - 25 minutes. Or I much preferred to put the aubergine in a roasting tray or loaf tin, add in few tbsp of water and cover the tray or tin with foil then bake at around 180deg C for about 1 hour or a bit more till cooked through. Test with a skewer into the centre layer of aubergine if it pierces through easily it's cooked. Then carefully transfer the aubergine onto a dish, save the cooking liquid. Now make the sauce. 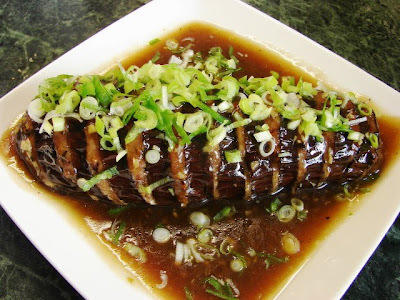 Fry a little of chopped garlic (1 clove) with around 2 tsp of chopped ginger with some cooking oil, then add in 1.5 - 2 tbsp of oyster sauce, the aubergine cooking juice, 1.5 tbsp shaoshing wine, a little light soy sauce (optional), pinch of ground pepper. Stir then add in 1/2 cup of water mixed with 1 heap tsp of cornflour, stir till hot and thickened. Finally add in a dash of sesame oil. Pour the sauce over the aubergine. Then garnish with chopped spring onion. this is a gorgeous recipe. i dont eat pork but will try it w mince chicken. your photos are always so beautiful. Looks fabulous sunflower. I must get to Lidl and stock up! What a great idea, lovely recipe. You're right--they have been giving aubergines away in Lidl! We haven't done anything nearly as nice with them though. This looks delicious. I have to wait until I go to Glasgow to get certain ingredients though--nothing exotic in the very far north of this country! Thanks for the excellent recipes. Ah! Mum makes somethng quite similar to this. 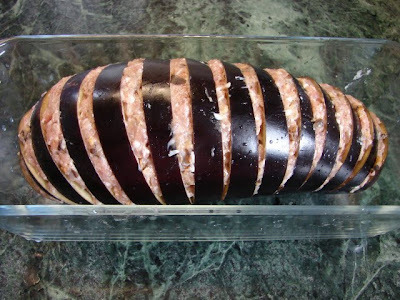 Only difference is the aubergine is not left whole but is cut into thick rounds then split in the middle (but still attached) like a sandwich and the meat carefully stuffed inbetween without breaking the aubergine sandwich. It's placed in a deep sided dish and steamed and the juices are made into a sauce like yours. It was the only way my brothers would eat aubergine when we were little! Yes I do that too, nicer with oriental aubergine (thin long one). If your mum is from HK she probably knows 煎酿茄子 (fried stuffed aubergine) which is very nice and Hakka style 釀豆腐 (stuffed tofu) with stuffed aubergine and stuffed chilli all braise together with yellow bean sauce is really nice too. Haven't tried the chinese aubergine, but I know what you mean - it's a paler purple more violet in colour. We sometimes have fried stuffed green peppers but rarely aubergine fried. We have it with a oyster sauce flavoured sauce rather than yellow bean. I grew some mild dark green chillies in the summer and we had those stuffed and fried - although not spicy hot, they had the aroma of chillies. Delicious! Well, best get back to baking - have made peanut cookies and need to make some pineapple tarts today! May try to make some peanut oil puffs 花生油角 for CNY too. Wondering how yo got on with making your "角仔 - Gok Jiy" the other day? I was helping my mum at her house and got as far as roasting and skinning her peanuts for her! Didn't get as far as making pastry or wrapping any of them! How do you make your pastry? I haven't been feeling very well for the last two days. Hopefully will make some tomorrow. Do you not know how to make kok zai? My pastry is std, just flour, egg, oil/lard, water, pinch of salt and a little sugar.